Emue designs and develops authentication software solutions for Financial Services, Contact Centre and Network Access markets globally. Emue’s technology powers products such as Visa's CodeSure solution which incorporates the world’s first scheme-based payment card with an embedded keypad, display and microprocessor. 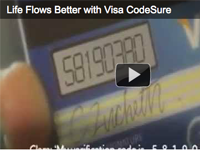 See the latest Visa CodeSure card in action.